Host a No-Sew Fleece Blanket Making Event! ​I am interested in hosting a blanket-making event. What do I need to know? 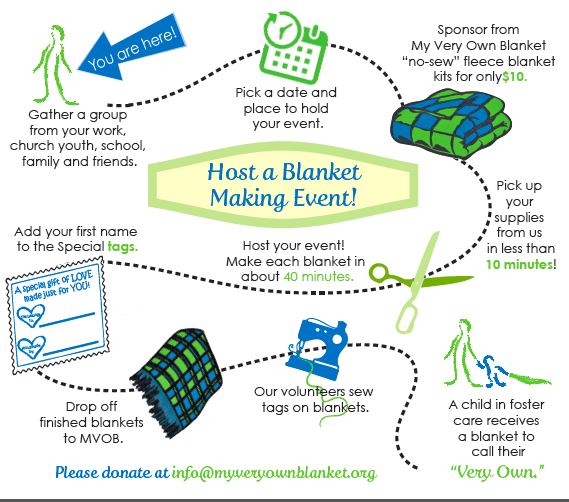 A blanket-making event is a great way to get families, friends, work colleagues, social groups, Scout troops – just about any group – involved together making our “no-sew” fleece blankets. You will need to select a date and a location for your group to make their blankets! When you sponsor the blankets from us, we will gather all the supplies needed; you will just need to gather a pair of scissors for each group member. We offer in our workshop all the supplies needed to complete your blankets. We have fleece in numerous colors, styles and prints (all age appropriate) for only $10 each. You can choose your own fleece, or we can pre-select a variety for you. Each fleece kit includes the material ready to cut and fringe, the fringe cutting template, the special tag ensuring the blanket will stay with the child when they move from placement to placement, the packaging and shipping we provide so that blankets reach children in foster care, and the opportunity to be a part of our ministry. When you order your blanket kits in advance, everything will be ready for you to pick up so that you are in and out of the Blanket Workshop, ready for your blanket making party, in less than 15 minutes. At the bottom of this page is our graphic illustrating the process. Do you have promotional material or videos I can use to show my group? Channel 4 news video with Rick Reitzel, Colleen Marshall and Mike Jackson. About 1 minute! Check out our website, www.myveryownblanket.org, for more information. Follow us on Facebook (www.facebook.com/myveryownblanket) for news and photos of blanket makers, new blankets and events. You are welcome to copy and hand out our flyer at any event to help us raise awareness of our mission and ministry.